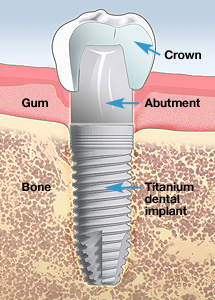 A dental implant is made up of three components: a titanium screw-like structure that is surgically placed into and fuses with the jawbone, an “abutment” which is screwed into the top of the implant, and a crown which fits over the abutment which looks and functions like your own natural tooth. Dental implants may be used to replace individual teeth, multiple teeth, or all of your teeth in one or both arches. In the case of a full arch, 12-14 teeth can be supported by as few as four implants. 2) Is getting dental implants painful? Most patients report a minimal amount of pain both during and after having dental implants placed. When compared to other types of surgical dental procedures like extractions or gum surgeries, patients generally report less discomfort after having implants placed. 3) Will my insurance cover the cost of getting dental implants? Recently, many insurance plans are starting to cover implants at 50%, and the crowns or bridges on top of the implants are covered at the percentage that is normally covered by your specific plan for conventional crowns, bridges, and partials. Every individual plan can be different, and we will be able to verify exactly what your covered benefits and yearly allowed maximum is when you come in for your consultation. 4) How successful are dental implants? Implants successfully "osseointegrate" with the jawbone in about 96% of the cases. In the few cases that a dental implant was to become loose, a new one can be placed a few months later which will have an equally high initial probability of success. Once integration with the surrounding bone is complete, again, only a very small percentage will ever become loose or need to be replaced. Smokers and other generally health compromised patients usually do however, have lower implant success rates. 5) Are there age restrictions or recommendations for dental implants? The generally accepted minimum age for being able to receive implants is about 17-18. This is when the jaw has finished growing and changing in shape. There really is no maximum recommended age, but rather is based on the health of the patient. Research has shown that osseointegration occurs at an almost equal success rate in healthy older individuals as it does in healthy younger individuals.